The Dachshund (pronounced dak-sund; also known as a ‘Teckel’) originated in Germany in the sixteenth century. They were bred and trained to chase down prey, such as a badger (Dachshund means ‘Badger Dog’) or fox, enter its burrow, kill it, and retrieve it. The Dachshund was recognized as a distinct breed in 1910 and has gradually increased in popularity to become a favored pet. Famous Dachshunds include Picasso’s dog Lump, who may have inspired some of his works, and Waldi, the first Olympic Mascot and symbol of the 1972 Summer Olympics in Munich, Germany. The Dachshund coat may be smooth, long, or wire-haired. All have distinct appearance. Colors can be reddish-brown, black, tan, chocolate brown, deep chestnut in reddish-brown, and black and tan. The hairs on the wire-haired Dachshund should lie flat and be as hard as possible. Dachshunds are energetic, brave, intelligent and independent. They are quite happy, even clownish, and can behave mischievously on occasion. The Dachshund greatly enjoys interacting with humans and is quite friendly and outgoing at home. Dachshunds make fine companions and are not typically used as hunters. Dachshunds are energetic, brave, intelligent and independent. They are quite happy, even clownish, and can behave mischievously on occasion. The Dachshund greatly enjoys interacting with humans and is quite friendly and outgoing at home. Dachshunds make fine companions and are not typically used as hunters. The Dachshund is somewhat reserved around strangers and may bark at them, but forms a strong bond with family. It can be too courageous around larger dogs. Dachshunds are bold and outgoing, enjoying attention and frequently seeking adventure. They get along well with known children but may behave aggressively towards unknown children. Wired-haired Dachshunds tend to be more lively and outgoing then smooth-hairs; miniature Dachshunds may also be more reserved. You can find Dachshund puppies priced from $150 USD to $3000 USD with one of our credible breeders. Browse through our breeder's listings and find your perfect puppy at the perfect price. The Dachshund is somewhat reserved around strangers and may bark at them, but forms a strong bond with family. It can be too courageous around larger dogs. Dachshunds are bold and outgoing, enjoying attention and frequently seeking adventure. They get along well with known children but may behave aggressively towards unknown children. Wired-haired Dachshunds tend to be more lively and outgoing then smooth-hairs; miniature Dachshunds may also be more reserved. 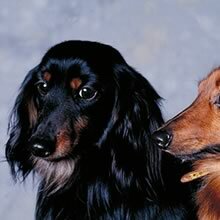 The smooth- and long-haired Dachshund should be brushed occasionally to remove dead hairs. Long-haired Dachshunds are prone to tangles, so they should be groomed more often. The coat of the wire-haired Dachshund should be plucked twice a year. Dachshunds live 12-15 years. Long-haired Dachshunds are slightly easier to train than smooth- or wire-haired Dachshunds, however all varieties need firm and consistent training because they have minds of their own. The Dachshund is also sensitive and should be corrected gently, lest it become cowed and afraid. The Dachshund needs a small amount of exercise; medium length walks or a fair amount of play in the yard should be sufficient. Dachshunds may tire easily so exercise should be spaced out throughout the day. Dachshunds can live comfortably in an apartment, but it is best if they get an occasional view of the wild. Frequent jumping and running should not be allowed as it may cause back problems. Dachshund Puppies for Sale - Shipped Worldwide! Finding the right Dachshund puppy can be dog gone hard work. PuppyFind® provides a convenient and efficient means of selecting and purchasing the perfect Dachshund puppy (or Dachshund puppies) from the comfort of your home, 24 hours a day, 7 days a week. Take advantage of our PuppySearch or leisurely browse our directory of hundreds of dog breeds, Dachshund dog breeders, Dachshund dogs for adoption, and Dachshund puppy for sale listings with photos and detailed descriptions. Some Dachshund puppies for sale may be shipped Worldwide and include crate and veterinarian checkup. Many Dachshund dog breeders with puppies for sale also offer a health guarantee. With thousands of Dachshund puppies for sale and hundreds of Dachshund dog breeders, you're sure to find the perfect Dachshund puppy.